The Tollywood Actor Jr NTR chief guest at the Dhee 10 Grand Finale of ETV Telugu’s hit dance reality show. Some Dhee 10 Grand Finale photos and videos were taken on the sets of the show gone viral on Social Media. Now Mallemalatv Released Dhee 10 Grand Finale NTR Introduction Video Promo on Youtube which went viral. Dhee is one of the hit Telugu reality TV shows. Talented artists showcase their dancing skills in front of a panel of judges. Actress Priyamani and choreographers Shekhar Master and Anne are the judges of Dhee 10 season, while Pradeep Machiraju hosts it. If we are to go by the buzz on Twitter, this show will have its grand finale in a couple of weeks and Jr NTR would the chief guest on this occasion. 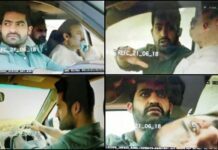 The buzz on social media claims that Jr NTR would perform a dance for a couple of songs from his films on the Dhee 10 Grand Finale Episode show.